Spectacular Villa with fine decorations, valuable frescoes and surrounded by a beautiful Italian garden. This original villa, now a 4 star hotel, is a pearl of art with incredible original XVII Century frescoes which are considered authentic masterpieces. The entire venue offers an extraordinary atmosphere where history, art and impeccable service excellently combine. 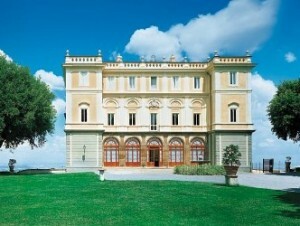 It also includes a wonderful restaurant and a panoramic terrace overlooking the city of Rome. Perfect for elegant and romantic weddings.